This video short is a piece created by award-winning Tom Lowe and I thought it was so powerful I wanted to share it with you all. It’s comprised of beautiful time-lapse footage and an equally as beautiful soundtrack, looking at both the American Southwest and some of the people in it. It’s not completed yet, but you can check out timescapes.org for more footage and sign up to receive emails when more is available. There’s also a blog and a twitter to follow. Turn your volume up and enjoy! The woman said to me, “The exhibit talks about how we’re in another big extinction right now. That one species – mankind – is the cause of the extinctions. That’s never happened before.” She went on to describe a ticker that shows in real-time how many extinctions are happening right now. She quoted 30,000 per year (an underestimate according to the UN Environment Programme), and as she stood there at the end of the tunnel of earth’s evolution, she witnessed the extinction of four species as the ticker ticked away. Admittedly, I’m a big softie inside and I had to fight from tearing up too. The truth is, for a lot of us, this kind of information is devastating. It’s overwhelming. It makes you feel powerless, and nothing feels worse than powerlessness. For this exact reason, I admit that I never read or looked at any photos about the BP oil spill other than what I had to hear from other people’s conversations. I just couldn’t bear it. Extinctions have sped up since the times of colonization because modern societies have an absolute addiction to development. We wipe out forests, wetlands, and meadows for housing, farming, and shopping centers. We’re only now realizing the interconnectedness of all things; there’s still an argument that early hunters caused the extinction of mammoths, but things are never so simple. Changing climates, changing plant communities, competition, and predator pressure all play a factor in the extinction of a species. Unfortunately, mankind’s need for expansion destroys habitats, which destroys food, and also introduces invasive species that increase competition or predation. While it’s true that extinctions are part of the natural cycles of the earth, there has never before been such a mass extinction on a global scale, encouraged by one singular species the way there has been in the last several thousand years. We still battle for animal rights; it’s clear that the Gray Wolf is an endangered species, but the government allows inflated rancher “interests” to pull the species off the list, further threatening its already dwindled existence in the US. 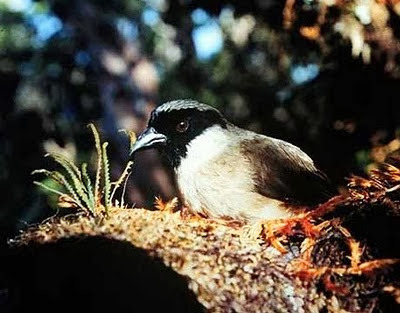 The Po’ouli, a rare Hawaiian bird believed to be extinct as of 2004. We’re only now learning to take into account the whole picture. When we fill up our gas tanks, we imagine oil fields in the Middle East, out in the middle of barren deserts. Like the mammoths, it’s not always that simple. For example, Shell is a mega-corporation that owns oil wells in South America and a great deal of oil pollution washes into waterways used by indigenous communities. Villages have been ruined and natural resources dramatically reduced. Because they have no money and no voice, they usually cannot fight to save their lands. This is not just a story of Shell, but of dozens of enormous, wealthy corporations who put money over life. There are many more pieces to the puzzle than we’ve been taught to believe. At least in America, we’re still teaching our children that we have the right to lord over natural resources and use them up. We’re still indirectly teaching manifest destiny. We are literally taught that being parasites is natural, okay, and the way it should be. My heart went out to this visitor because I empathize with her pain and the pure shock of such information. A quote attributed to Freeman Tilden but actually by an anonymous park ranger came to mind: “Through interpretation, understanding. Through understanding, appreciation. Through appreciation, protection.” We can’t protect something until we care for it, and often – especially in this society – we can’t care for it until we learn about it. We also have a lot of social injustice to overcome before we can really do what’s necessary; after all, when there are communities struggling to feed their children, how can you convince them to care for their environment? I told this woman that there’s hope yet. There are tons of amazing organizations that get people out in the dirt, rebuilding shorelines, planting new forests, and trying to restore some of what we’ve lost. The best way to fight the destruction is to become a part of the conservation and reconstruction. Even if all you have time for is conversing with people about the issues and spreading accurate information, you can be a part of the solution. In the end, our efforts may be futile; at some point, our species will go extinct too, and the earth will do what it’s always done: regenerate and produce new life. A lot of people think that’s nihilistic, but those people are still convinced that nothing is more important than I, we, and man. Sometimes it’s the only notion that rests my heart. How do you deal with environmental degradation? Does it affect you negatively? The Painted Hills were an ancient floodplain home to small, ancestral horse species and other early mammals. Erosion has wiped away the more recent layers of soil to reveal this amalgam of clay and minerals, which, true to its name, looks like it was painted with a big red brush. [Video Links] It’s Nest Cam Season! Yippeee! The Phoebe Allens camera is watching a hummingbird nest containing (so far) a single, jellybean-sized egg. (Scroll down to see the camera.) The ads and the random chat line in the sidebar were weird and distracting, but this little hummie is totally worth it. I just found this awesome article on how predatory our little buzzing friends are too, check it out! Seems like hummies need as much or more insect protein than nectar! The Santa Cruz Predatory Bird Research Group is watching a momma Peregrine Falcon sitting on her fluffy gray chicks. Now remember, if you get all attached to the babies (or the parents), you may in for some heartbreak as raptors often lose chicks before they’re grown. Besides that, please take a look at any or all of these cameras; what an incredible opportunity we have to see these animals in their natural habitat, performing natural wild behaviors with modern technology! It’s way better than watching the news. By a LOT. Ahhh. I love nesting season. Happy Spring everyone! Comments Off on [Video Links] It’s Nest Cam Season! Yippeee!